We called ourselves Contrarians, as we walked it from West to East, unlike the great majority of Wall Walkers (Conformists), but were pleased with this decision. For one thing we started out on a pretty beach in glorious sunshine, and finished up in a beautiful city, instead of the other way around. For another, we had the wind at our backs most of the time, which was also good. And thirdly we walked towards people all the time and got to say hi and have little chats with them about the walk, what was in store and places to get food and refreshments along the way, which were sometimes few and far between. We also decided to take our time and planned for eight walking days instead of the apparently overwhelmingly usual five. I wonder whether this is a case of people thinking that’s how you (should) do it or some sort of time restraint thing? I mean, if you have one week to walk it you still have the extra weekend before you have to be back at work. Only one other couple had planned for six days rather than five, and most were a bit taken aback and possibly slightly jealous when we said we would take eight days. Suited us fine, we were on holiday after all and wanted to stop and take photos, have leisurely lunches and enjoy our surroundings while we were there. Also there was the nerve-jangling thriller of boots vs shoes before leaving. In the end we did take the shoes plus sandals for sunny and also strangely wet weather, thinking that if it was wet, we would get wet and could then choose to get wet in sandals and then change to dry shoes after. As it was, we only got wet once, not in the rain but the day after, when we walked through wet grass – plus I misjudged a boggy bit and got one soggy foot but that was user error. Our shoes dried quickly though and they were wonderfully light, airy and flexible on the trail, which consisted of tarmac, dirt paths, paths through fields, gravel and stone. Boots would have been too heavy, too rigid and too hot and I am very glad I took my shoes – a great thank you to Rose of RucksackRose and Melensdad from the Camino de Santiago Forum who helped me overcome the boot pressure and make that decision. We got rained on twice, and I put my poncho on once, while Scouse Spouse preferred to just get rained on in his merino T-shirt and enjoy the warm weather. All in all we had lovely weather, lots of dramatic overcast skies and a fresh wind to keep us cool. As for the trail itself, it started off nice and flat. A bit too flat to be honest but there you go, you can never please everyone, and we did make a note to selves that we might just miss the flat in a few days. (We did.) When we got up onto the crags though, on days 4 and 5, the views and the sheer madness of the wall were amazing. Personally I enjoyed the up and down, the way the landscape always changed and you never knew what magnificent views you would find over the next crest or around the next bend. Loved it! After the fun bit it became very anticlimactically flat and also there was a bit of tarmac, which made my PF flare up. 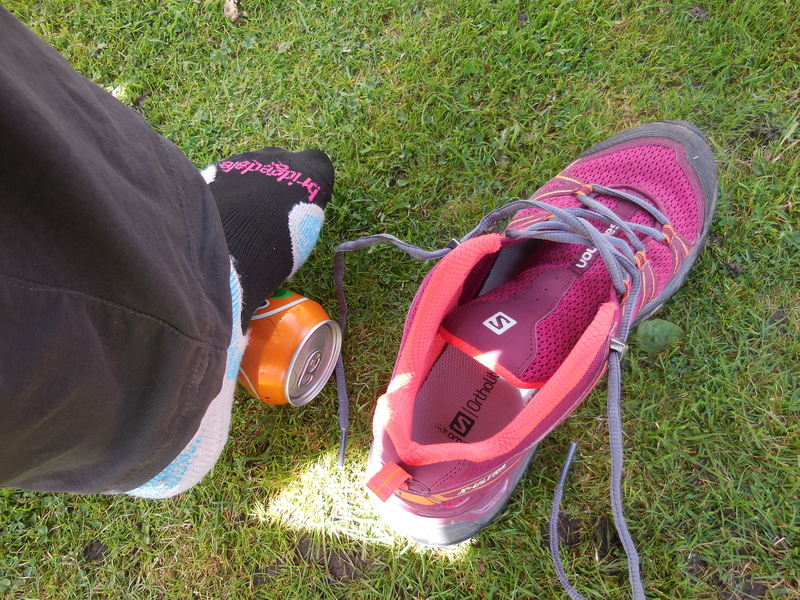 My new best friend was a cold can of pop which I would buy at the bar and then roll under my foot to ice the sole – absolute heaven, this really works! Then just before leaving I would get a glass and some ice cubes and drink the pop to add sugar and hydration before moving on. I will definitely continue doing this on my walks, maybe take iced bottles with me from home. Unfortunately, or maybe fortunately, we decided to call it a day when faced with a very long flat day next to the road. We had planned to stay at the Robin Hood Inn, but they were refurbing, so we had even more miles added to the day’s walk. 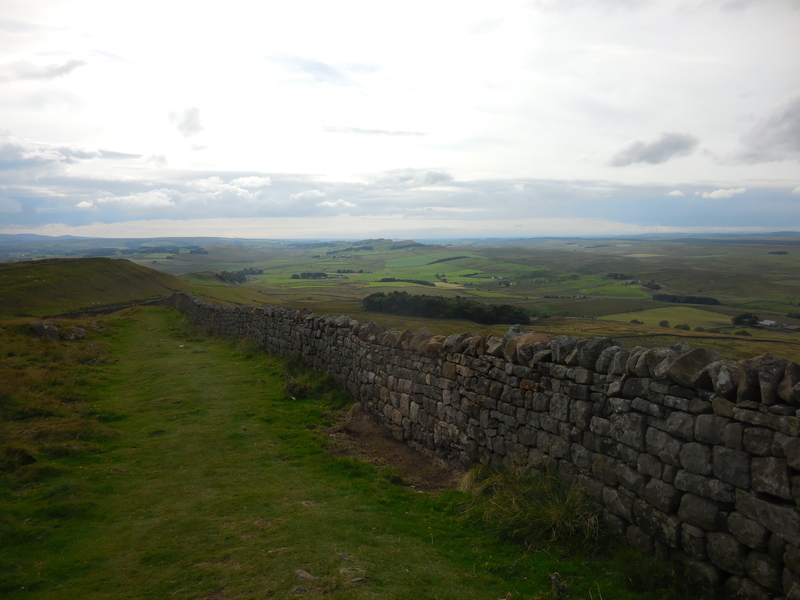 So instead we went up to the Chesters fort and museum and really enjoyed seeing the finds from the forts along the Wall. The next day we went on to Newcastle and got the bus out to Wallsend and Segedunum, where unfortunately the bath house was closed! All in all it was a fabulous little holiday crammed with views, friendly people, good food and even a city break thrown in. More later!